Imagine stepping into an exciting space full of letters. This is paradise for graphic design lovers, where heavy wooden old-style furniture hides a real treasure – a few tons of lead letters, wooden letters for posters and even plastic ones from the long forgotten Eastern Germany. You can even find approximately 60 years old diverse machinery there that ranges from a very simple table top press used for test prints to the entirely automated Heideleberg GT which weighs more than a ton! The founder Marko Drpić, master of calligraphy, an art historian and librarian, says he is in love with letters. The enthusiastic man gained knowledge all around the world and now tries to preserve an old printing technique. He also spreads the knowledge in various ways and carries out printing and calligraphic workshops for children, youth and adults. A very talkative man and pleasant interlocutor, he is always willing to share his expertise. 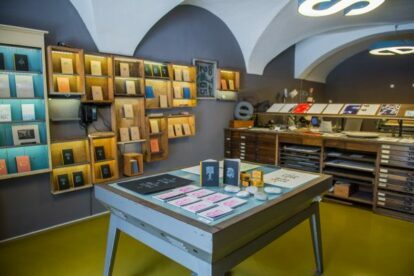 If you are very passionate about TipoRenesansa letterpress studio, you can also get insight from the collection of documentation and professional books, or even order brand new handmade unique business cards made by this talented man. Before leaving the place don’t forget to check out the ceiling lights as well. They are made from old promotional lettering that once decorated one of the facades in Ljubljana. Marko gave some of the big blue letters a new purpose after he managed to save five of them before they were taken to the junkyard.